Homer J. Hall, 89, of Rockford, Ohio, went home to be with the Lord on November 22, 2018, at the Laurels of Shane Hill in Rockford. He was born January 18, 1929, in Quaker City, Ohio, to the late Homer C. and Anna (Miller) Hall. On July 8, 1950, Homer married Joan Miller, who preceded him in death on March 30, 2018. Surviving are his daughters, Deborah Hartman of McKinney, Texas, and Brenda Hall of Scottsdale, Arizona; his son, Kim (Linda) Hall of Florissant, Colorado; one grandson Ryan (Courtney) Hartman, a great-grandson, Blake Matthew Hartman, and a great-granddaughter, Charleigh Quinn Hartman all who survive in Prosper, Texas. One brother, Vernon Hall survives in Quaker City, Ohio; a brother Cecil Hall and a sister, Anna Marie Miller are both deceased. Homer had been employed as a field rep by the Central Ohio Breeders’ Association and was the manager of the Mercer County Production Credit Association. He then went to the Van Wert/Paulding Counties Federal Land Bank Office, where he was the Manager. He then went to the Citizens Commercial Bank in Celina, Ohio, where he was employed as their loan officer, and worked there until his retirement. 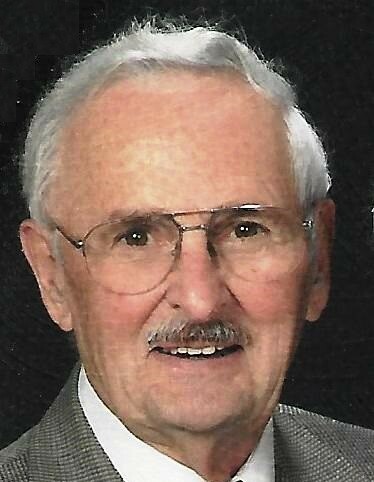 He was a faithful member of the Rockford United Methodist Church in Rockford, Ohio, where he served as a trustee for many years. He had been a member of the Rockford Chamber of Commerce, the Shane’s Crossing Historical Society, and a past member of the Rockford Lions Club. In 2001, he was honored by being named Rockford’s Citizen of the year.